Make reports & charts about card counts, spent, estimate and remain (and 20+ other fields). ★ Mouse-over Query fields for contextual help. 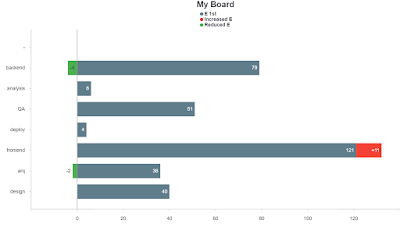 ★ Play with "Group By" and "Since" to find the report or chart you want. ★ Use "Stack by" from the "Chart" tab. ★ Click to copy reports and download charts. Paste on an email or spreadsheet. ★ Quickly see reports and charts: click Spent, Remain or Reports in the Chrome Plus menu. ★ Click rows to highlight rows and view partial S / E / R sums. ★ Pick custom columns, view Labels under "Options" ("Pro" version). Why sometimes column names end with a * ? Estimates not showing or incomplete? See the "Since" filter. Cropped results? See report "Options"
Other frequently asked questions (FAQ). Click to jump to Examples below. Great reports and charts start with great data. 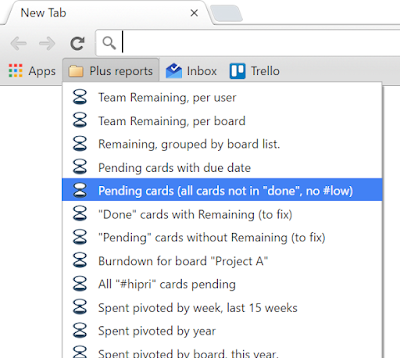 Trello has users, teams, boards, lists, labels, cards and dates. Plus adds keywords, hashtags, spent, estimate and s/e notes. Use them all to your advantage. Ideally, you should organize your boards similarly. That way your reports and charts can filter across multiple boards or teams to get the big picture. In particular, by sharing common label names, list names and hashtags across boards you will be able to filter, group and stack across common categories. 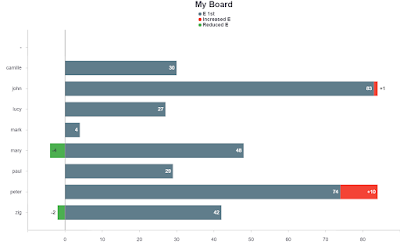 Even if you do not need to aggregate teams or boards data, you will still benefit by creating all your Plus charts and reports once (for a single board), then simply replace the board filter to view a different board. Save your custom reports and charts as a Chrome bookmark. Email the URL to others, or copy/paste the report or chart directly on emails, documents or spreadsheets. Group by multiple fields, pivot, stack, filter on anything with advanced support for "AND", "OR", "NOT" on teams, s/e users, boards, lists, hashtags, labels, cards, keywords, note, archived or deleted on card counts, Spent versus Estimates and Estimates changes. E first versus E current per user. Easily add custom backgrounds or watermarks by exporting a transparent PNG. - Add them easily from any card front by just typing it on the drop-list. - Hashtags are global across all your non-archived boards. - The hashtags list is automatically maintained as you rename cards or archive boards. - Hashtag names are shown on the back of cards. - Add multiple hashtags per card. Group and Stack by hashtags, filter by any hashtags with AND/OR/NOT support. Labels are different because they work per-board. Plus ("Pro" version) supports filter/group/stack/count/sum by multiple labels. Plus can color the background of the card using the color of the card label (see Plus preferences) to further highlight the card. Label colors and names show in Plus reports and when stacking charts by label. See them in action: Group by "Board" and stack a Chart by "Hashtags" or "Labels". Use filters, for example List "!done" to filter out S/E in lists named "done", or filter on label "red" to just view those. Spent / Estimate reports also have "keywords" and "S/E user" with group, stack and filter of your Spent / Estimate / Remaining data, as well as a “S/E Notes” filter / group / stack. Stacking by "S/E Note" is great for our automatic time-in-lists Butler integration. Keywords are a stricter way to categorize S/E work because you must pre-define them in the Plus help pane sync section. Keywords work with the “card comments” sync mode. By default, there is only one keyword called “plus!” but you can add/rename as many as you wish (with or without the exclamation mark). For example, have keywords per team, as in “test!, design!, dev!, publish!, docs!, spec!”, and that list will appear in the card S/E bar (desktop and mobile), reports and burn-downs. Use "S/E user" (or simply User in the column name) to group, stack and filter by the card S/E user. "User" refers to the Trello user that has assigned card S/E and not to card members. Filtering by "user" will exclude cards without S/E. When not filtering by user, grouping or stacking by user will show a blank "-" user for cards without S/E which is a great way to detect cards with missing S/E data. Applies to S/E based reports only. If not using S/E, you can still do great card count charts and reports. Every time a user enters or modifies S/E, Plus enters a new "S/E row" to keep the full history of a given card S/E for each user. To view full history, including S/E "notes", group by "S/E rows". If you instead group by "card" things will look more familiar because Plus will sum all S/E rows per card and only show one report row per card (and will show more columns like "Due date"). Experiment with other groups and look at examples. When grouping by other than "S/E rows" you will usually want to use "Since: all dates" so that Plus adds up the full S/E history of all "S/E rows" per card. Otherwise Plus will only add up "S/E rows" entered in the specified date range, thus S/E/R will show the change for that date range. A card with total S:20, E:25 has 5 units Remaining. See a detailed explanation in the Plus help pane. By keeping your estimate up-to-date (Adding or removing when needed) you can better measure "Remaining" per user, team, board, list, card, hashtag etc. using reports. Plus will remember your initial Estimate (1ˢᵗ Estimate, for later comparisons in reports). To view accurate Remaining in a report, you must use "Since: all dates" so that Plus adds up all "S/E rows", otherwise total S/E/R will just show how S/E/R has changed for the given date range. Refers to the user that entered the given S/E. It does not refer to card members or to users performing other actions (like moving a card). This is sometimes a cause for confusion for users that do not use the S/E features. Summarizes multiple rows into a single one. Groups with a dash, like "Board-User" will group rows by board, then by user. In this case, all S/E rows with the same board and user will be grouped on a single row summing its Spent, Estimate, Remaining and Card count. Groups by "S/E rows" or "user" are only for those using Spent/Estimates and will only search in "S/E rows". 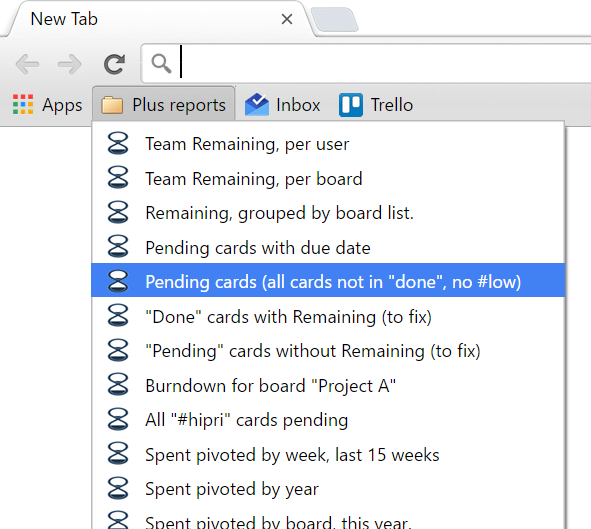 The rest of the groups are useful to all Trello users and will include both S/E rows and card data. Group by "hashtags" or "labels" is special because a card may have multiple of those. Plus will split report rows by multiple hashtags and labels and will show a warning when it does so. This split allows you to count/sum cards by each. For example, a card with labels "Red" and "Green", when grouped by "labels" will produce a report with two rows, each with a count of "1". The warning is shown because the total count (2 in the example) is not the card count because the same card appears in both rows. Note that the older "hashtag1" group-by still works and does not split rows because it uses the first hashtag only. It still exists for legacy support but we recommend changing to the new groupings. For example "Date*". Plus appends the "*" to any column that is showing partial information because of the group-by. For example when grouping by card, there may be many "S/E rows" for a given card, thus Plus displays the Date of the last row in that group. Custom columns can sometimes force this situation. For example, if you group by Board, normally Plus will not display the "Card" column. But if you pick it with custom columns, Plus will show the column name as "Card*" and show the name of the newest card per row. 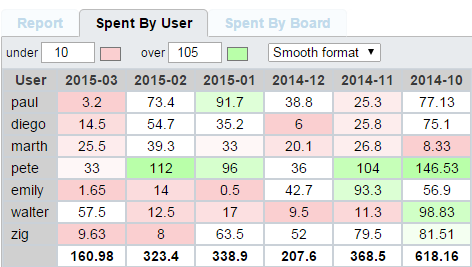 Pivots the report Spent into multiple columns on the "Spent by User/Board" tabs. You can pivot by Year, Month, Week or Day. order by "R" (Remaining) does not show rows with zero "R". order by "Date due" shows only rows with a due date, and only works when grouping by card or card-user. order by "List position" is only available in this drop-down, since there is not column for list position. This order is useful to sort your reports and charts just like you see them in Trello. Re-order results by clicking the table header (scroll to the first results row first). To order by multiple columns, click the first column and SHIFT-click the rest of the columns. Click again the column to reverse order. Plus by default orders by Date. You may prefer to re-order based on the report "Group by". For example, when grouping by "board-list", order by "list position". When grouping by "board-card", re-order by clicking the "Board" column header, then shift+click the "Card" column. Sorting results by clicking headers preserves selected rows. After sorting, bookmark the report to remember all your customizations so next time you just click a Chrome bookmark or share the bookmark with a team member. Filters results by case-insensitive "contains" in all (AND) filters. AND / OR / ! (not) are supported for user, team, board, list, card, note and keyword filters. hello AND world: Contains both "hello" and "world". hello OR world OR #low: Contains any of the three terms. hello AND !#low: Contains "hello" and not contains "#low". "hello OR goodbye": Does not use "or". Instead must contain literally "hello or goodbye". hello AND goodbye OR low: This is not supported. Do not combine AND with OR in the same filter. hello OR this has many words: Matches "hello" OR "this has many words". Do not put the quotes directly. Note "OR" and "AND" (case-insensitive) are special words. If you must search without Plus interpreting special words put double-quotes around the entire search text. Filter by date relative to today. When the report row has S/E, it uses the date of the S/E row. Otherwise (a card without S/E rows) it will use the date of the card's last activity. Pick "Advanced" to filter by date, week or month ranges. When filtering by date, E and R may be off because it may filter out part of the Estimate history. for this, report Options has a setting to exclude cards with partial E. Use to only show cards that were estimated during the date range in the "Since" filter. Shows only if you configured multiple keywords in the Plus help pane. Matches rows for the given S/E user. If the card does not have user S/E, its user is blank. Some users confuse this with card members, understandably so. Report rows without S/E will show a blank user. Matches rows containing the given text. Search hashtags in the card field, as those are part of the card name, as in "#high" without the quotes. Reports show and filter by labels when "Pro" is enabled. Labels support limited AND/OR/! filtering. Hover the "Label" filter for more information. To match rows not containing, start with "!". Example: To exclude those cards with a "#low" hashtag filter cards by "!#low". Always is the list a card is currently in, not where it was historically at the time of the report row. To see lists enable "Sync". If the user later changes her estimate with another S/E row, its E.type will be +E if increased, or -E if increased. Cards with a name containing "[R]" are recurring cards. Those will not produce +E or -E rows and their "1ˢᵗ estimate" will always change to match the current Estimate. These appear when you open a report from the board report icon or from a Card report link. These are similar to filtering by "Card" or "Board" except that their report URL will work even if the card or board is later renamed. You can see those Trello ids in the URL of boards and cards. A board named "my board" might have an url like https://trello.com/b/T6g7VrXA/my-board, where the board "shortLink" is T6g7VrXA. Filters only rows after the given value. Appears only when clicking on the Plus menu "New S/E" report. Rows start at 1. Setting the field to 0 will show all rows. Might be used for advanced integrations. To help team members review incoming team S/E rows, the "New S/E" report (available from the Plus menu) shows unread S/E team rows. click to mark all rows as read. Note: Many examples use "pivot by year" simply so the report runs a little faster. For reports and charts about time in lists, see this page. If you dont need to see multiple boards at once, start the report by first going to the board then clicking the report button top-right (or use the Chrome Plus menu to open the report from there). This opens the report pre-filtered by that board which makes charts simpler to make. Note that many of the report examples below apply mostly to users using Points/Spent/Estimates. Sort this report by "Due date" and it will be easy to estimate work load per user. Note that in all "Remaining" report examples, the pivot by year is simply to make the report faster. The "Card-User" group is treated special: It will also show cards that do not have any S/E (blank user) so you can easily detect those cards. Grouping by "card" is also useful to detect those cards without S/E. By grouping by Card-User the report shows the user column (you can also show it with custom columns). By sorting by user, it shows first cards without an S/E user. All those cards have no S/E. See an overview of S/E/R per day. These groupings make more sense when ordered by Date, not "R" like the previous examples. 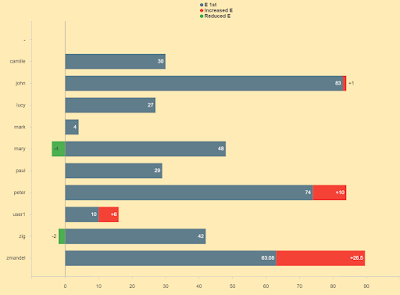 Compare both "E" columns from the chart tab using one of the specialized Estimates bar charts. In this example you get an overview by board. One you find a board to further investigate, filter by that board, then group by card to find the cards you want. At the user level, you could start with a group by user and continue with a group by card like in the example above. to see the current S/E distribution among lists without having to open the Trello boards. This is also more poweful that just looking the list sums in the trello board page because it can include archived cards and can also be seen offline or across many boards. Plus may add text between brackets to row notes as in "[error: bad format]". Error rows are painted red and always have "[error:" in the note.You may see warnings in some situations like ambiguous relaxed format in a card comment. Those rows notes have "[warning:" and are not painted red.When a row is back-entered (using -5d for example) the note will have "[-5d]" added.Impersonating a user adds "[by user]" to the row note.You may find these rows by making a report filtered by note. Change color ranges by typing a value for "under" and/or "over". Customize the colors by clicking each color. The column for the current week does not color "under" because most of the week it would be showing the low color. Smooth format will also color near values. 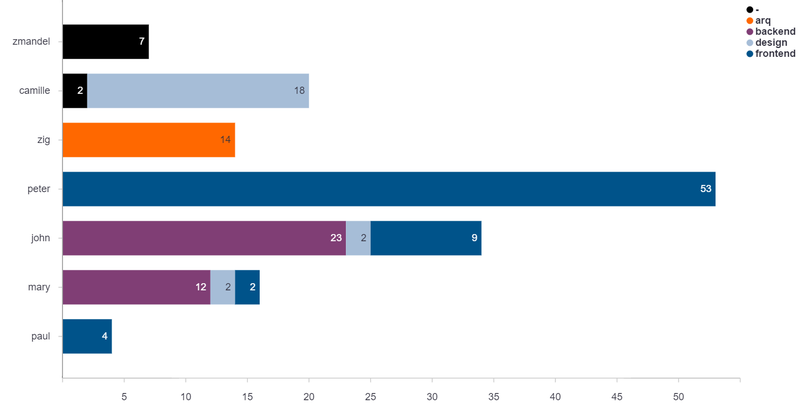 Chart S/E/R or card counts based on the chosen "Group by" and "Order by", "Stack by" and filters. Spent, Estimate, Remaining: To view them each separately. Supports stacking. Spent & Remaining: To view progress. E 1ˢᵗ versus E: Compare E 1ˢᵗ with E side-by-side. E change: A visually different way to view the previous chart as positive and negative changes. Card counts: Visualize card counts in multiple ways. Supports stacking. S/E/R Burn-Down: Links to a custom burn-down based on your filters. Use this to build burn-downs across multiple teams and boards. If cards have negative remaining, the chart will not display them when Plus preferences is set to "Allow negative Remaining". 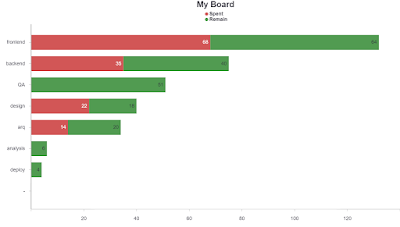 Charts stacked by Labels uses the Trello label color. Grouping supports arbitrary groupings separated by "-". You may add custom groupings by URL or with the "custom..." item in the listbox. Ordering allows one level only. To show text without the "..." cropping, add "&checkNoCrop=true". Even if you leave cropping 'on' (unchecked), you can still see the full row note by hovering the mouse. Copying a report or pivot will also copy formatting, tooltips and selected rows (click rows to select them). Copying a chart downloads it as a transparent "PNG" image. Use as-is or use an image editor to customize the background or place watermarks. Pasting reports with formatting, tooltips and selections work when pasted on a Gmail message, Excel or any program that accepts "rich format". Other programs (like Google spreadsheets) will show the data without all the formatting, selections and tooltips. To automatically download reports (as CSV or XLS) view the "Options" section. Rate us at the Chrome store!